Moco Online: Larry, Moe and Curly Joe? Larry, Moe and Curly Joe? We are thinking that the term Stooges has been used a little too much around here lately. OR woo khould be three of the Barx Brothers! w00f's, looks like a nice way to spend ur time...me iz doing that too today, its still raining here..
so, you needs another sib or two, huh. Then no jokes. Peess: I am sorry that the package has not arrived yet. I sent out 4 packages on the same day and none of the recipients have received theirs too. I think its going to take some time fore the package to travel to where you are. At least you still get to sleep on the bed! Oh everyone looks so comfy..
How could anyone use the word "stooges" in your presence!? HAHAHAHA! We always get compared to things that come in threes. I do NOT appreciate it. Maybe you could get a fourth--no more Stooges? I have been called worse! (much)! Did you hear they are making a Three Stooges movie and Sean Penn & Jim Carry are gonna be two of the stooges??!? 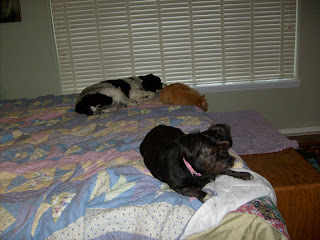 All three of you guys look mighty comfy on that bed! Can I join? Lucky guys! You got that big bed! I don't know the meaning of Stooges but sure you look very comfy there on the big bed! Too funny! My morning radio talk station was talking about Larry, Mo & Curly and his wife got them so confused with the Marx Brothers just like our friend Kyyra! Too funny that you brought this up. You need a number 4! Awwww you guys are so cute snuggled on the bed! We wish we got to sleep on the bed! But wat if it'z a gud nickname? Mommee callz us dopey boyz--shood wee bee upset? you do look pretty comfy napping on your bed. Those are great pictures! 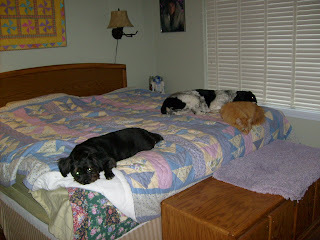 That's what my mom's bed looks like when me, Ziggy and Libby are on it! Tommy (the orange cat) usually stays away when we're all on it but some times he joins in too. We had a pretty lazy day here today too. Lots of rain and then some snow. Enjoy your weekend. I sure don't see any stooges!! sheesh!! Nice bed you got there! Looks like there's plenty of room for more friends! hehe! We get called the 3 stooges, too. Humans are weird! I think there's room for me that bed, too! Larry, Moe, Curly Joe and Petra Ho! You all look so comfy there! There's 3 of us over here too although I call us Me, Myself and I. Gee...does that sound pathetic?